Team roping requires close cooperation and timing between two highly skilled ropers - a header and a heeler - and their horses. The event originated on ranches when cowboys needed to treat or brand large steers and the task proved too difficult for one man. Similar to tie-down ropers and steer wrestlers, team ropers start from the boxes on each side of the chute from which the steer enters the arena. The steer gets a head start determined by the length of the arena. One end of a breakaway barrier is attached to the steer and stretched across the open end of the header's box. When the steer reaches his advantage point, the barrier is released, and the header takes off in pursuit, with the heeler trailing slightly further behind. The ropers are assessed a 10-second penalty if the header breaks the barrier before the steer completes his head start. 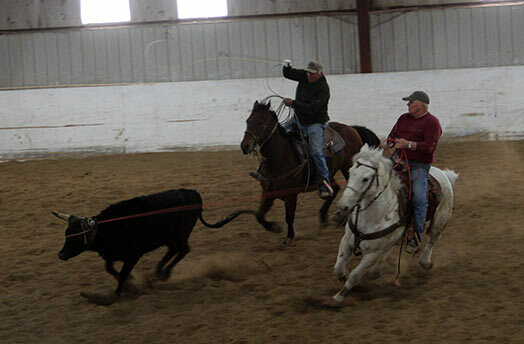 The header ropes first and must make one of three legal catches on the steer; around both horns, around one horn and the head or around the neck. Any other catch by the header is considered illegal and the team is disqualified. After the header makes his catch, he turns the steer to the left and exposes the steer's hind legs to the heeler. The heeler then attempts to rope both hind legs. If he catches only one foot, the team is assessed a five-second penalty. After the cowboys catch the steer, the judge flags the run and the clock is stopped when there is no slack in their ropes and their horses face one another.